Sending Combo of gifts to surprise your dear ones from our online portal. You can choose flowers can cakes combo, flowers and teddy combo, chocolates teddy and cake combo, etc, to woo your loved ones completely. Our combo is available for same day delivery too, so being too late is no more an excuse! Gifting a combo rather than one single gift is very much in trend. But what we all want, is affordable combo of amazing gifts at the comfort of our home. Now adding to this, more convenience is there for you, as we at MyFlowerTree are giving Same Day Delivery Combos. You can choose our variety of special and completely wonderful combo to gift your dear one’s on any occasion. Be, it birthday, Valentine Day, Anniversary, special days in a valentine week, Mothers day, father’s day, etc, we have unique, affordable and best combo available here that can be delivered easily on the same day of your given order. You just need to place an order 3 hours before and rest leave on us. When it’s a special day, of yours or your dear ones, then why to delay in choosing best gifts? Now you explore amazing assortment of combos here like: Pink combo (8 pink roses and 1 pink teddy bear) Passionate forever combo (bouquet of 10 red roses and chocolate cake), Bouquet of emotions combo (10 red roses, 2 cadbury dairy milk silk, black forest cake, 1 teddy bear) emotion explosion (6 assorted roses and pine-apple cake), beautiful bouquet of teddies, pink rose and black forest cake, 6 purple orchids and chocolate cake,6 purple orchids and chocolate cake, white roses and choco chip cake, combo of pink and white carnations, oriental lilies, Asiatic lilies and chocolate truffle cake, heart shaped 50 red roses and 1 kg heart shaped chocolate cakes, many more. 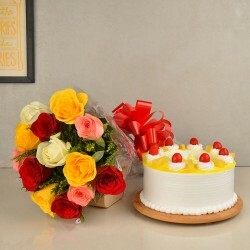 You can send desirable, tempting and extremely delectable combo of cakes with freshness of flowers at the same day of order to your dear ones place. You can also choose Same Day Flowers and Chocolates Online as a combo for the beautiful surprise like 12 pink carnations with Ferrero Rocher chocolates, Red roses and dairy milk, rose and wine combo with delicious Ferrero Rocher, celebrations with colorful roses, etc. Gifts are a true mood lifter and they can turn any boring day into a romantic one, especially If there is beautiful flowers, cakes, and personalized gifts available as a combo. Now, you can get these all under one panel at MyFlowerTree. You can select the best combo to convey your romantic feelings to the one you admire. Besides, you can also get these delivered at the doorstep on the same day of order, so what could be more exciting than getting everything at the comfort of your home. Products in this category have been rated 4.7 out of 5 based on 113 reviews.